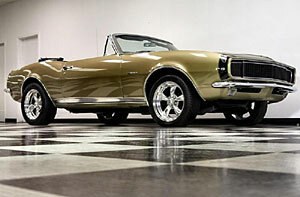 RARE #'S MATCHING AND COLOR CORRECT GOLD ON GOLD RS CONVERTIBLE . (((THE CAR IS LOADED)))INCREDIBLE AND UNIQUE. This car is extremely rare original and loaded with power steering, power brakes, power windows, power top, clock on the console and AIR CONDITIONING. You have to see this car to appreciate it. We just picked this car up from California and it was worth the trip. The car is extremely original with the original 6-2 Granada Gold paint and 711-2 gold custom buckets with white stripes. The car still retains the MM code 327 ci block with 275hp and a 4 bbl carb. The metal structure of the car is fantastic from top to bottom and bumper to bumper. The BRAND NEW power top functions as it should. The Air Conditioning blows cold. 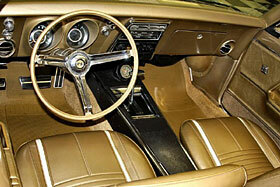 The gold interior is in very good shape as seen in the pictures. The console is also in great shape. 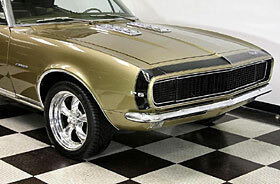 WE HAVE A BRAND NEW GOLD BOOT THAT IS ON BACK ORDER THAT WILL COME WITH THE CAR.